Evaluating what to do after retirement can be complicated, even stressful. However, for some, life after retirement is a new beginning - just ask Dee Boreing. For Boreing and her husband, Jack, retiring from their full-time jobs opened up new opportunities to serve others. In August, 2005, Hurricane Katrina slammed the Gulf Coast with terrifying force. Less than a month later, Hurricane Rita cut a swath over much of the same landscape. Thousands evacuated, some never to return to their homes. For those who stayed, it's been a long journey back into livable residences. As site coordinators for Camp St. Paul in Ocean Springs, just east of Biloxi, Mississippi, the Boreings work six days a week, organizing teams of hundreds of volunteers determined to help the people of the Gulf Coast get back home. Camp St. Paul is a division of the United Methodist Committee on Relief. Please describe your typical day at Camp St. Paul. It is hard to say there is a typical day here, but the day starts in the kitchen preparing breakfast at 5:30 a.m., the volunteer teams eat at 6:30 a.m, and we have devotion at 7:00 a.m. Then, the teams are off to the assigned work sites. Jack and I deliver the needed materials to the sites the day before. The next few hours are spent visiting each site and seeing if anything is needed. If so, we fetch what ever it is and deliver back to the teams. If we have new homes to check out, we will set up appointments with the homeowners and do an evaluation for the work and materials needed to start preparing for work on the home when we have teams in. We return to camp to prepare for dinner at 6:30 p.m. Then, paper work and visiting with the teams until about 10:00 p.m.
You and Jack, a retired airline mechanic, sold your home and business to volunteer with the United Methodist Volunteers in Mission program, doing work not only for Hurricane Katrina and Rita relief, but also down in Mexico. This is correct, we have been working on a project in LaUnion, Mexico, for five years. 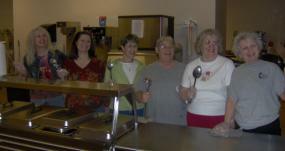 Taking on a project like this one for UMCOR isn't like volunteering at a shelter once a month. Why this, and why to such a level of commitment? This is not where we thought we would be doing mission work, but it is where God sent us. Our faith is where we are committed, so wherever God sends us, we give 100 percent. How long have you been involved in hurricane recovery, and what lessons have you learned? 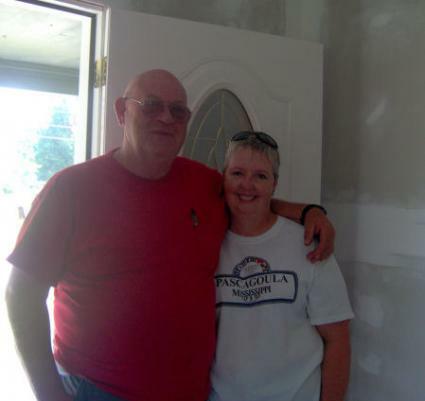 We've been on the Gulf Coast since January, 2006, starting as volunteers in Pascagoula, Mississippi. The most valuable lesson we have learned is to have complete trust in God in everything we do. Has there ever been a day when you wished that, when considering what to do after retirement, it mostly involved sitting on the back porch, enjoying a glass of iced tea, with nothing more to worry about than pulling a few weeds from the flower garden? No, that has never been a vision for us. Our life is service to others. You are 55, and Jack is 64. Had the two of you always planned to be this active in the so-called "retirement" years, or is this something that just happened? The word retirement is never mentioned in the Bible! To us, there is no such thing. We have never thought of not being active. How many other seniors have come to Camp St. Paul to volunteer, and what do you think motivates them? I cannot tell you exactly how many seniors have been here, but I can tell you there have been a lot. Our oldest was 88, and he worked most of us into the ground. I would say the motivation is service, being a faith-based organization that is just who we are and what we believe. Any time we serve others we receive more than we give. If someone is sitting on the fence, wondering if they have the energy or the strength to get involved in a project like this, how would you encourage them to give it a try? Just get off the fence and do it! If you sit around waiting for strength and energy, you will never get it. We get our strength from the Lord on a day-to-day, sometimes a minute-to-minute, basis. Does Camp St. Paul only take faith-based groups of volunteers, or can individuals or other groups contribute their time? Anyone can volunteer! We are faith-based, and most of our teams come from churches, but we don't turn anyone away. Finally, when this job is complete, what do you want to do next? Serve. We will always be serving somewhere. The summer of 2008, we will be serving in the south of France for three months, and after that? God has not told us yet but we know he will make it very clear where he needs us. Whether you're deciding on what to do after retirement, searching for a new volunteer program, or want to get some friends together for a special activity, helping rebuild communities in Mississippi and Louisiana is a worthwhile venture. UMCOR is just one of the many organizations dedicated to post-hurricane housing recovery. Through the UMCOR website, you can request a multimedia volunteer recruitment package or contact a recovery representative if you have specific questions. Ongoing reports indicate that faith-based organizations are leading the hurricane recovery efforts in Mississippi and Louisiana. In fact, nine out of ten new homes built in southern Mississippi are built by groups from not just one denomination, but people of all faiths coming together to have a positive impact in the area. If you attend a spiritual center, ask the governing body if there is a relief effort established.